Kris’s Note: Yow! I’d forgotten how quickly these short chapters could go. So, here’s the first of Book Two, continuing where “They That Walk in Darkness” left off. Tremendous thanks to Worthy/Cybra for her “gift fic” based on our series. ::squeal:: Read it! I love it! And, always, thanks to everyone who reads this. Special thanks to my mother for her proofreading skills (as always) and thanks, hugz, and Stix to Sagey! Did they think that Jake and I would plan to escape if we were in the same time slots? Did they think that we’d be capable of hurting each other if the first option wasn’t possible? At least we’re on good terms with each other again. I smile at that. Things seem to be looking up a bit now. I’m actually enjoying a decent nap. My head is buried under my pillow, my rail thin body actually comfortable on the even thinner mattress. Then, the sound reaches my ears. A roar of sound. And, following just behind it, a bone-jarring rumble that seems to shake the very prison itself. I sit bolt upright, sweating and breathing heavily. Like waking from one of the old nightmares. I can feel the tension in the air. Then, I hear the voices. Yelling. Whoops of excitement. Looking through the bars, I see inmates run past my cell. What? Where are the guards? I see more prisoners. Running past my cell. The eyes of some look excited. Some look frightened. Others gleam with pure malice. And, for a moment, I can’t comprehend it. No one breaks out of Alkatraz. It doesn’t happen. I could probably walk to that door right now and it would open. I could be free. No. I belong here. I deserve to be here. I let myself slump back onto my creaking mattress and stick my head back under my pillow. Blinking, I sit upright as a sudden explosion rocks the island. In a sudden reflex, I run to look out the bars of my cell. What is going on?! Turning to look out, I see but a few prisoners running down the hall, guns in hand as they do. The guards, on the other hand, don’t seem to be anywhere. I look at this, thinking it over, willing to admit that I do want to get off this island as much as the next kat wants to. But… is this worth it? What if I do escape? Then what? Become a fugitive on the run? Be hunted down like some primitive beast once the law finds out I’m gone? It’s not worth it. I’ve been through enough. A frightful thought crosses my mind at that. What about Jake? Where would he be in all this? With them? Think positive, Furlong. He wouldn’t do that… Not now. Not when he’s promised you he’s changed. Shots ring out, the sizzle of blasters… then a trio of prisoners armed with laser rifles strides down my cellblock, looking for guards. I can hear them already. I look up at the trio with a blink. I can only narrow my eyes towards them as I stay put. I’m not ready to walk out like this… not ready to be part of their criminal tendencies. One of them looks at me. “Chicken, Big Guy?” he sneers. Good. He hasn’t recognized me. 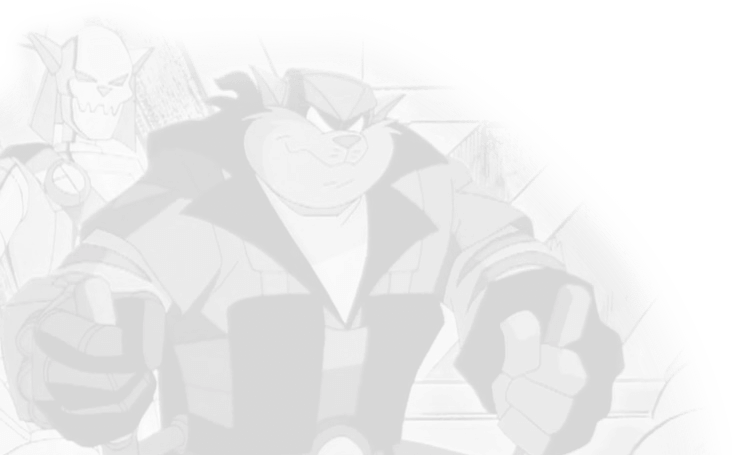 Granted, I haven’t seen this guy before, but rumor has been spread around the prison of my reputation as one of the SWAT Kats. But, he doesn’t mention that. He sees me as just another law-abiding wuss the prison managed to break. “Not quite,” I retort. “Maybe I’m just sane enough to stay put where I belong.” The henchman sneers at me. Maybe now he’ll leave me alone. Their leader abruptly looks over to join in the sneering. I can only pray that they’ll be on their way and let the rest of us law-abiding wusses behind. Think, Furlong, think! Get these creeps off your back! “What is it you want?” I snarl through clenched teeth. The leader shoves him aside. No. I’m not getting off this island. Not like this! If I have to fight them off, I will. “In your dreams, creep,” I snarl with my fists raised. I pause at that. He has the upper fist for now. At that, I raise my hands. It doesn’t mean he can shut me up. Crud! I don’t want to do this! Getting off the island and becoming a fugitive isn’t what’s bothering me. It’s the fact that if this guy *does* get me off this island, I’ll be facing Dark Kat… Just when I thought I was free and safe from his torment. No! I can’t do this! The leader is sent reeling back, but not as far as I would have liked. In the last year in jail, I’ve lost the full strength I had when I worked out daily. Unlike the rumors I’ve heard about some prisons, Alkatraz clearly isn’t one of those cushy prisons with satellite TV and gyms for the prisoners. The henchmen level their guns on me, and one fires, grazing me. I scream as the burning sensation of that laser penetrates the fur and skin on my left arm. I snarl at those words as I grasp my arm, giving him a patent pending glare that only few know. It means that deep down I’m ready to rip out his spine and floss with it if he isn’t careful. <Don’t spot Jake… Don’t spot Jake,…> I start thinking. They haven’t mentioned him through all this. Hopefully, they’ll forget about the “other SWAT Kat.” I hiss as the henchmen get on either side of me, one of them jabbing me with his gun roughly in the area of the wound on my arm. I feel my heart skip a beat. They remembered. “That’s *your* problem!” I scream. “You want the SWAT Kats, you take *me! * I’m just as good a prize as anything! You just KEEP JAKE OUTTA THIS!” My words are as true as any. I don’t want this, but if I want Jake alive, then it’s the only way. Let them take me and let him be. He doesn’t deserve any of this. He doesn’t deserve to die if we’re brought to Dark Kat. It almost happened once. I’m NOT letting him die. “Do I hafta’ spell it out for you! ?” I scream again, grabbing him by the collar. Only seconds later do I feel a sharp pain against my gut, just seconds after this guy quickly thumbs his blaster’s setting down and nails me without thinking. “Do I have to spell it out for YOU, you lunatic!” he screams. Teeth clenched, I clutch my stomach as I pick my head up to look at him once I’m on my knees. “We’re not a prize to be sold out on the open market,” I growl. I fall back down to the floor, fighting to remain conscious. Kats… I’m a whole lot weaker than I thought. I’m rather surprised, though. Distracting this guy wasn’t anything I had in mind. Sure, I want to get off this island… but not like this. Once again, the leader bends by me as I struggle to stand. 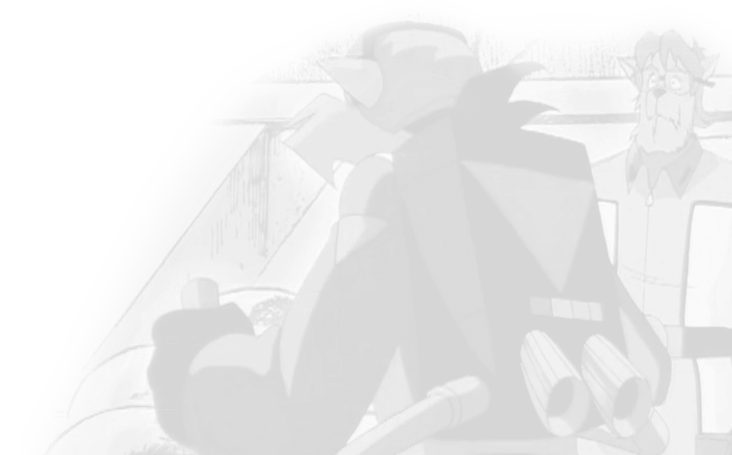 He suddenly pauses to look up as his henchman abruptly haul in another kat… one I feared they’d find. Jake doesn’t look much beyond disgruntled, and he’s still his thin self. But, he’s coming in willingly. I wonder what they told him. His cry stops my musings once he sees me on the floor. I have to reassure him that I’m okay. With a grunt, I pick myself off the floor once again. I know Chance is lying. I can see where he’s injured. Can see the blackened fabric across his stomach. The angry welt rising under the fur on his face. I turn my head to see what’s obviously the leader of these guys motioning for us to move out. Resigned, I let myself be herded along, making sure I end up beside Chance. Once I’m in hearing range, he grumbles something about the leader being insane. Holding what must be another injury on his left arm, he gives me a side look. I can see the pleading in his eyes. He’s pleading for me to get away when and if I get an opportunity. But, you know the rule, Chance. It hasn’t changed. It may have been a bit forgotten there for two years, but I remember it. It’s either both of us or neither of us. We’re a team. We’re partners. We’re *friends*. That in mind, I give Chance a determined look in return. I can almost sense him sigh back. As we’re lead out of the cellblock and to the front entrance, we pass a lot of guards. Some of them are moaning softly, clearly very much alive. Not stunned, but obviously hit with blasters set low enough to only sear the upper layer of fur and skin. At least the masterminds behind this – our captors – weren’t willing to be guilty of mass murder. Point for them,… but they still don’t get a star or a cookie. I look ahead to see a large supply boat waiting at the prison’s single pier, crowded with prisoners, pushing and shoving. Looks like this is going to be a fun ride. Once we’re close enough we could dive into the water. It’s murky enough to give them a hard time pinpointing us if we stayed under and headed around the coastline. Headed to the back of the island where we might could hide. There should be some drainage openings along there. And, all we need is time. Enforcer choppers should be arriving any minute. Surely someone got off a distress call. At the least, surely the blast was reported. Surely they’ve pinpointed it by now. We’re nearing the pier. I look again at the shoreline. No… It doesn’t get deep enough fast enough. We wouldn’t be underwater before we were flash-fried. I look over at Chance, wondering if anything has occurred to him. That’s when I decide it’s best I ditched my idea. He’d never make it anyway. As we’re herded down the pier and onto the rocking boat, I can tell Chance is getting dizzy, fighting to remain conscious as he stumbles along. Reaching the boat, we’re met with a wall of kats. The leader screams at them and quickly clears a path by waving and using his blaster liberally, still set low thankfully. Once we’re through, he forces us on, up to the control room. Blast it! I continue thinking even as I lean into Chance to help him stay up after a rough shove from one of the thugs. He’s not doing well. “Thanks, Jake,” he whispers before sliding to the floor. Good. He might as well try to regain some strength. We’re both gonna need it. I sit by him, leaning against the wall as the boat starts moving. I need a plan. I look from my partner to the goons standing around us. Their weapons are only casually aimed our way. They’re obviously more interested in their escape at the moment. Good. The slacker they are, the easier it will be. And, Chance and I need every point in our favor we can get. And, I’d hate to give that piece of slime the satisfaction. Not to mention my vow. I’m not dying only weeks after I chose to live. And, I’m not letting Chance die either. No, once we’re off this boat we might as well already be dead if they have a ride waiting on them. No, I wasn’t being fatalistic, just analytical. I look at my wounded partner. And, feel more determined than ever. With effort, the big kat manages to stand up and look out. I watch him… and the guards. One glances our way, but, after checking to see that a friend is stationed near the door, looks away. I look back at Chance. From his frown our time must be running out. We must be nearing the docks. I nod. Then, I quickly search the cramped cabin for anything we can use. Any way to distract the guards. Looking up, I note a fire extinguisher over Chance’s head. I look back at the guards. Their eyes are focused outside, toward the shore. He nods. “Yeah, I c’n manage… I take it you have a plan?” he asks, giving me a weak grin. Then, I stand slowly, riveting my eyes on the window. As discreetly as I can, I nudge my partner toward the fire extinguisher with a foot even as I turn to the nearest thug. “You have a Kleenex or something I can clean him up with?” I ask, nodding toward Chance. I can only hope that Chance is already taking the cue and using my distraction. A plan. Thank heaven. I trust you on this one, Jake. I stand up, reaching for the fire extinguisher Jake’s spotted. I’m suddenly beginning to realize what his plan is. It’s desperate, but it’s the only chance we’ve got. With one hand, I take the extinguisher and hide it behind my back. Jake, on the other hand, doesn’t have this thug’s pity. At those words, Jake shrugs and turns away… before abruptly swinging around and sweep-kicking him. Thank goodness for those martial arts lessons when we were in the Enforcers! Taking this advantage, I shake the extinguisher and nail the others, including the leader, with the foam. That done, Jake grabs me by the collar and bolts out the door, plowing over the blinded kat barring the way. I’m not ready to turn back. I make a run for it towards the other end of the boat. And, without having any second thoughts, I run towards a side, and leap headfirst into the bay. I feel Jake following my lead as I hit the water. Popping up for air, I barely miss the firepower of two other thugs that are taking no chances in letting us get away alive. I dive under again to avoid the blasts, Jake doing the same as we make a swim for it. I feel the heat cut past me in the water, and I avoid it as much as I can as I blindly swim forward, every second making sure Jake’s right behind me. In fact, he’s right beside me, taking the advantage that he’s a faster swimmer and that he’s not injured. Half-starved as much as I am, but uninjured. I’m weakened due to my injuries, but I continue swimming. For the moment, my main focus is getting on dry land and finding shelter… finding a place to hide. My fear has come true. I escaped from prison and am now a fugitive from the law. Unwillingly, yes. But, I still escaped. It seems like an eternity, but I finally manage to reach shore, crawling out and gasping for air as I do. Suddenly, the thought of finding shelter is no longer with me. I’m too weak. I can’t take another step. I struggle out of the water right behind Chance, staggering to my feet. Only one thought is on my mind. We have to keep moving. Have to get out of here. I look up to eye the filthy spit of land we’ve found ourselves on. Just before us is a cliff dotted with drainage pipes. I try not to think of the crud that must be in my fur after swimming through water from *those*. At least it hid our trail. Chance sees the cliff too. I quickly check the big guy’s injuries. Nothing too severe. The cuts’ve almost stopped bleeding. It’s the burn on his stomach that worries me. And, Chance’s next words terrify me. I don’t think they still grant sanctuary, but there should be someone there that will ask questions before firing and maybe offer us a First Aid kit while we wait for the Enforcers to come pick us up. Good enough. Nodding, I reply, “Good. We’ll head there…” Then, I turn my eyes to the cliff. I start to think I’ve crossed higher mountains than *that* in the last few weeks. Both of us have. I bend to sling one of Chance’s arms over my shoulder. Jake has a new girlfriend, but she has a few secrets about her family ties that may get in the way of their relationship.